How many fatherless children do you know? Fatherless children come from married homes, unmarried homes, single homes, they’re orphans, and almost anything in between. Men can father children easier than they can truly be a father. It’s a part of our society and a problem in our society that the Bible addresses very clearly. One fatherless child may not have ever met his father. Another fatherless child may have had many bad experiences with their father in the past. And another fatherless child may only see their father when he wants something from them. Yet another fatherless child may live at home with his father every day but not have the love and attention he needs or deserves because of his father’s preoccupation with other matters in his life. The scenarios are limitless. 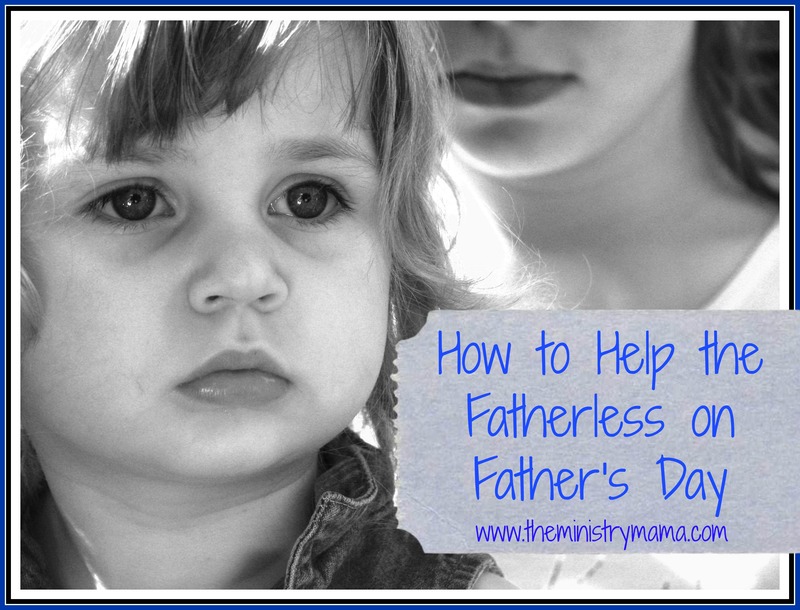 Fatherless children tend to have heartache and problems on Father’s Day. Their hearts hurt and yearn for a father that will love them and care for them and listen to them. Here are some ideas, as many of you will see fatherless children on Father’s Day in your churches, on how you can give them encouragement. Recognize the void. Look for those that are fatherless in your church. They will be of all ages, some people never outgrow the void that growing up fatherless gave them. Their void is having love, spiritual guidance, and physical needs met. Acknowledge their struggle. If there is not a physical struggle in the child’s life then there is probably a spiritual struggle. They ask themselves questions about who their father is, why he does the things he does, why God does not see their hurt and address their needs quickly, and if they are worthy of being loved. You do not have to say anything specifically to them about this struggle, but acknowledge that it is there in your heart. This is a genuine and Biblical void. Point them to the Heavenly Father. One idea is to ask them if they are doing alright on Father’s Day. Then lovingly remind them that God is a Father to all of those that need one. Give them a scripture or two in a note or on a notecard so they can take that reminder with them. They may even keep it in a special place and look at it now and then. Sunday School teachers can take special time in their class to remind children of the Heavenly Father’s unconditional love and care for them even if they are not able to talk to each child one on one. Pray with them if possible and pray for them as often as you think of them. If God allows you the opportunity, without making a spectacle out of the person or situation, ask them if you can pray with them. Then simply pray for their needs and thank God for being the best Heavenly Father a person could ever ask for. Be wise though, remember not to isolate yourself with a child or teenager in a room alone. Men should pray with boys and ladies with girls unless it is a husband or wife together, to prevent any type of false accusations. Provide any physical need they may have. Ask God to help you see the need of fatherless child in your church. If you see they need shoes then bring them a pair of shoes or a gift card so they can go buy a pair. Then let them know that God cares for them. Doing this will help them be reminded that God does care even though their earthly father may not. The church does not carry the responsibility to provide for those in need, He encourages us not to shut up our bowels of compassion for the needs of others. That verse is very powerful in motivating Christians to help others in need. Helping a fatherless child is no exception. Another thought, if you are a Sunday School teacher and you know a child does not have a father or a regular father in his life then be mindful when you are having your class make crafts. You could make your craft point to the Heavenly Father or give them an alternative to make their gift for a grandpa, uncle, or other father figure in their life. Sometimes these types of activities will isolate the child and make them feel sad. Instead of allowing someone to leave church feeling discouraged, make it a positive experience where they felt loved by you and their Heavenly Father. We have the wonderful responsibility of being able to point people to Jesus Christ and Father’s Day is just one of the opportunities we can have in showing fatherless children about a Heavenly Father. May you stand in the gap and be an encouragement to the fatherless around you! Happy Father’s Day to you all!